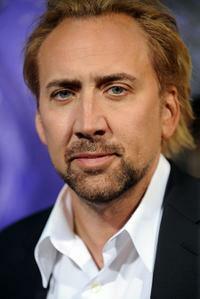 Nicolas Cage in "Drive Angry." Mark Zoradi, Producer Jerry Bruckheimer and Oren Aviv at the opening Ceremony of Disney's Inaugural D23 Convention. Nicolas Cage in "The Sorcerer's Apprentice." 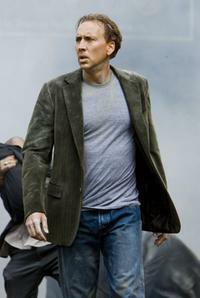 Nicolas Cage in "National Treasure: Book of Secrets." Diane Kruger and Nicolas Cage in "National Treasure: Book of Secrets." Producer Jerry Bruckheimer, Miley Cyrus and Nicolas Cage at the opening Ceremony of Disney's Inaugural D23 Convention. 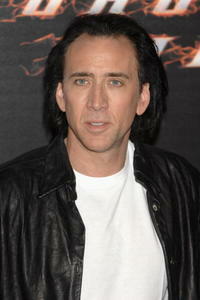 Nicolas Cage at the California premiere of "Drive Angry." 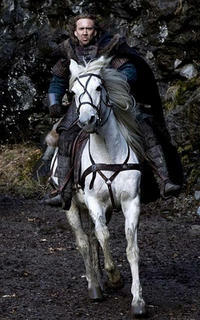 Nicolas Cage in "Season of the Witch." Nicolas Cage, producer Jerry Bruckheimer and director Jon Turteltaub on the set of "National Treasure: Book of Secrets." Nicolas Cage and Diane Kruger in "National Treasure: Book of Secrets." Alice Kim and Nicolas Cage at the New York premiere of "The Croods." 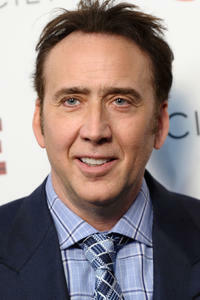 Nicolas Cage at the "Joe" screening in New York City. 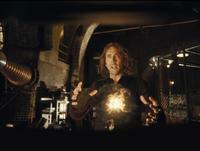 Nicolas Cage as Balthazar Blake in "The Sorcerer's Apprentice." John Travolta and Nicolas Cage at the opening Ceremony of Disney's Inaugural D23 Convention. Nicolas Cage and Producer Jerry Bruckheimer at the opening Ceremony of Disney's Inaugural D23 Convention. 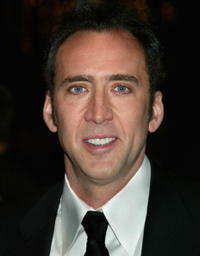 Nicolas Cage at the world premiere of "The Sorcerer's Apprentice." Nicolas Cage and Alfred Molina in "The Sorcerer's Apprentice." 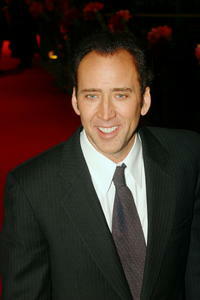 Nicolas Cage, Jon Voight, Diane Kruger and Justin Bartha in "National Treasure: Book of Secrets." 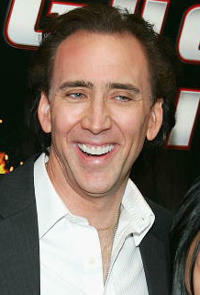 "National Treasure: Book of Secrets" star Nicolas Cage at the Japan premiere. "National Treasure: Book of Secrets" star Nicolas Cage and Alice Kim at the Japan premiere. 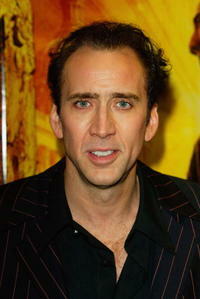 Actor Nicolas Cage at the N.Y. premiere of "National Treasure: Book of Secrets." 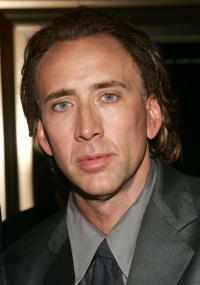 Nicolas Cage at the UK film premiere of "National Treasure" London. 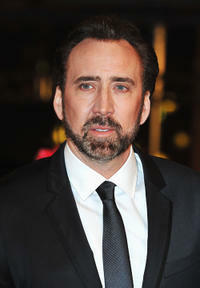 Nicolas Cage at the 53rd Berlinale Film Festival in Berlin, Germany. 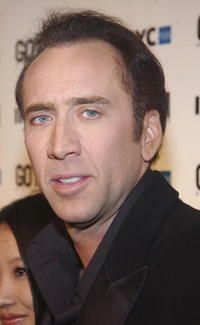 Nicolas Cage at the world premiere of "'World Trade Center" in New York City. 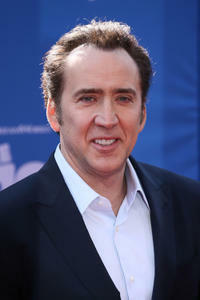 Nicolas Cage at the 55th Annual Writers Guild Awards in Beverly Hills, California. 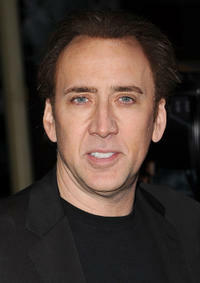 Nicolas Cage at the world premiere of "Ghost Rider" party in New York City. 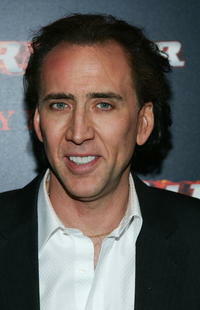 Nicolas Cage at the premiere of "Ghost Rider" in New York City. 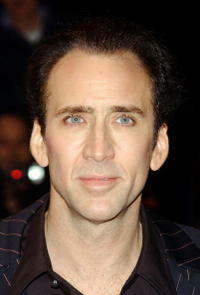 Nicolas Cage at the UK film premiere of "National Treasure" in London. 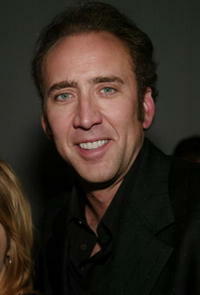 Nicolas Cage at the "Matchstick Men" premiere after-party in Toronto, Canada. 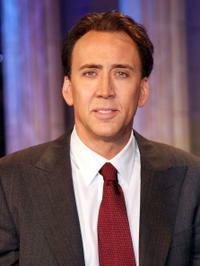 Nicolas Cage at a photo call for "Matchstick Men" at the 60th Venice Film Festival in Venice, Italy. 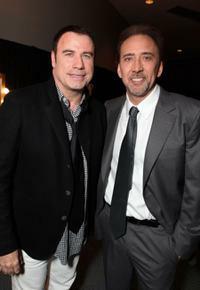 Nicolas Cage at the premiere of "Gone in 60 Seconds" in Los Angeles. Nicolas Cage at the Gotham Magazine 5th Anniversary in New York. 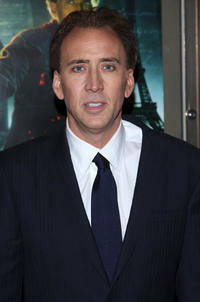 Nicolas Cage at the premiere of "The Weather Man" in New York City. 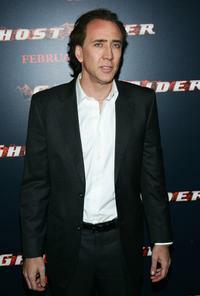 Nicolas Cage at a photocall for "Ghost Rider" in Madrid, Spain. 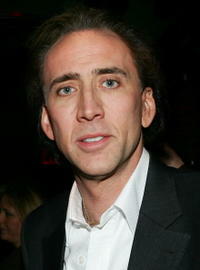 Nicolas Cage and Eva Mendes at the world premiere of "Ghost Rider" after party in New York City. 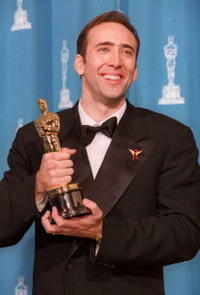 Nicolas Cage at the 68th annual Academy Awards in Los Angeles. 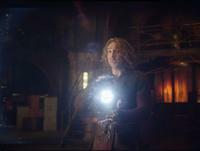 Director Jon Turteltaub and Nicolas Cage on the set of "The Sorcerer's Apprentice." Nicolas Cage on the set of "The Sorcerer's Apprentice." 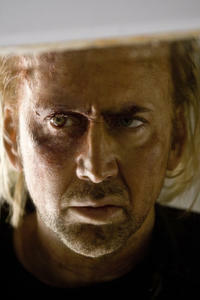 Nicolas Cage as Jack Halcombe in "The Frozen Ground." Rose Byrne and Nicolas Cage in "Knowing." Nicolas Cage and Monica Bellucci in "The Sorcerer's Apprentice." Nicolas Cage and Rose Byrne in "Knowing." 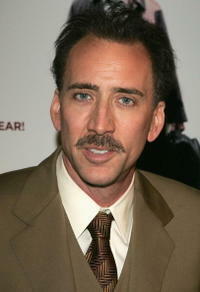 Nicolas Cage at the premiere of "Ghost Rider." 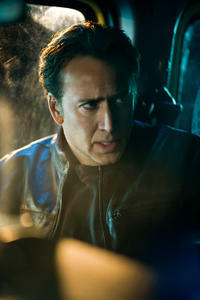 Nicolas Cage in "Ghost Rider: Spirit Of Vengeance." 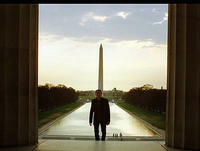 Nicolas Cage and Chandler Canterbury in "Knowing." 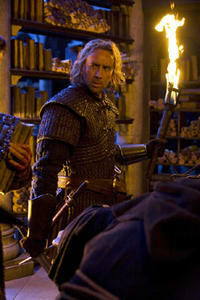 Nicolas Cage as Behmen in "Season Of The Witch." Nicolas Cage at the Germany premiere of "The Croods." 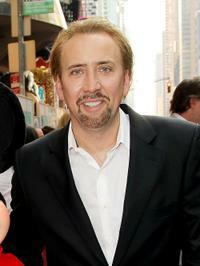 Nicolas Cage at the New York premiere of "The Croods."